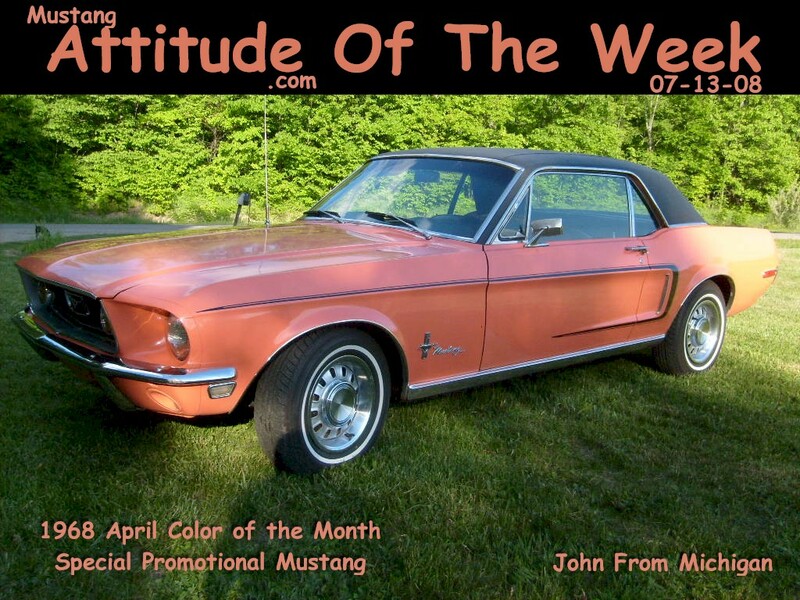 Expand to 185 photos (35 cars) found with exterior color of "pink"
(from page 8 of the 1967 Collection) Teri Garcia owns this Dusk Rose pink, 1967, 200 Sprint, Mustang hardtop which was our Attitude Of The Week for the week starting January 31st, 2010. Teri tells us more: My Mom and Dad bought me my 1967 Mustang in 1995 (my senior year of high school). When I got my Mustang it was Red. It is a 6-cylinder 200 sport sprint with a 3 speed on the floor. We did not know what we had until my brother went to put a new stereo in the car and saw the floor boards were pink. We ran the codes and sure enough it was originally Dusk Rose. My brother really had to twist my arm to restore it back to the original color. I always wanted a red Mustang. In 2002, I finally had it restore back to it's original color. It was done just in time for my wedding. In 2007 we had the engine rebuilt, engine compartment redone, and a good bit of the suspension redone. Restoring this Mustang back to the original color was the best thing we ever did. People are so curious about it. We have so much fun meeting and talking to people about our Mustang. We have won many awards. We have two 2nd place awards and one 3rd place from the All Ford Nationals in Carlisle, Pennsylvania. (from page 16 of the 1967 Collection) Dusk Rose 1967 Mustang coupe that still wears it's original coat of paint! Dusk Rose was a special order paint. This one was ordered by Hensley-Anderson Ford in Bellflower, California. (from page 18 of the 1967 Collection) Dusk Rose 1967 Mustang black vinyl hardtop with 14 inch red centered wheel covers, metal rocker panel trim, and a 200hp (at 4400rpm), 289 cubic inch, 2 barrel, V8 engine. This car has been repainted at least once, but in its original Dusk Rose pink. (from page 24 of the 1967 Collection) wear a Mustang to match your Tussy lipstick! says this 1966 ad for Tussy lipstick and a sweepstakes to win one of 5 Mustangs, in one of 3 different shades of pink. The text of the ad reads: Tussy's exciting new lipstick line features three racy new shades. Racy Pink, a pale pink, racy pink frosted, shimmers with pearl, defroster, pours on melting light to lips or lipsticks. In a brand new cage of sleek white plastic smartly trimmed with gold, on a swivel base... 1.00. And 5 lucky winners will receive a zippy '67 Ford Mustang custom-colored to the new Tussy lipstick shade of their choice. Be sure to pick up your contest entry blank at the cosmetic counter. This ad was placed by Rhodes Western Department Stores in the September 11th, 1966 edition of the Oakland Tribune of Oakland, California. Rhodes was a large, multifloor, department store in Oakland. It is now a Museum. (from page 26 of the 1967 Collection) Advertisement for the Tussy Mustang Sweepstakes. Three winners receive a 1967 Mustang in the Tussy Pink shade of their choice. The colors may have been the three new revved-up shades of Tussy lipstick: Racy Pink, Shimmery Racy Pink Frosted, and Defroster. This ad is from the September 1966 edition of the Seventeen magazine. The date of this ad may explain the use of a 1966 Mustang in the photos. (from page 27 of the 1967 Collection) Check out this Dusk Rose 1967 Mustang fastback. It's owned by Mats from Sweden. This is our featured Attitude Of The Week for the week starting September 10, 2017. Mats says its special order number 718000. We have records that this special order number also included Dusk Rose hardtops ordered by Foulger Ford in Monrovia California. (from page 27 of the 1967 Collection) Could this be a Dusk Rose 1967 Special Edition Colt Mustang? It seems to have the same Colt emblems as the 1966 and 1968 version - see the next photo. The car has a dealer emblem from Les McLane in York, Pennsylvania. A site visitor found this photo. We are attempting to contact the owner. Do you know anything about this car? (from page 34 of the 1967 Collection) Dusk Rose 1967 Mustang convertible at the 2010 MCA Grand National Car show in Bellevue, Washington. (from page 36 of the 1967 Collection) Check out this pink 1967 Mustang convertible with the white gut and white top. It has the GTA option installed (during restoration). It was at the 2007 Scottsdale Barrett Jackson auction. It sold for $49.5K. (from page 36 of the 1967 Collection) This is a contest that Dole ran in 1966. It was called the Dole Pink Mustang Sweepstakes. You could win a stable of pink Mustang. Actually you could win four pink* Mustangs. Two real ones for the parents and two Mustang Junior battery operated cars for the kids. This ad was found in the Des Moines Sunday Register comics section. Dole had a new product they wanted people to try, Pineapple Pink Grapefruit Juice - Drink. The bottom of the ad says "* or your choice of colors available". Does anyone out there know if these contest cars still exist? Did the contest winner pick pink Mustangs? Check out the runner up prizes. They are giving away two RCA entertainment centers. It's an old console TV and Stereo Hi-Fi setup - all in one. Cool! The fifth prizes are can openers! Probably to open the drink cans. (from page 38 of the 1967 Collection) Dusk Rose pink 1967 Mustang hardtop photographed at the 2011 Mustang Roundup car show held in Bellevue, Washington. This Mustang has the deluxe wheel covers with spinners. (from page 17 of the 1968 Collection) Passionate Pink 1968 Mustang hardtop sent to us by Scott from Stanton, California. It was originally aqua blue. Scott explains, "I bought it in 1988. In 2006 my daughter turned 16. I had it painted original Ford Passionate Pink, and gave it to her for her birthday." (from page 23 of the 1968 Collection) This amazing, special ordered, 1968, Sprint optioned, Mustang hardtop was purchased in 1968 and is still owned by Orville and Ann Werner of Colorado. It is also our Attitude Of The Week for the week starting June 17th, 2012. Orville tell us that he bought the 1968 Mustang off the showroom in Colorado which came with the Sprint package, 302ci V8 engine, and this amazing special paint. Since then Orville has seen other coral 1968 Mustangs in the area. "Samoan Coral" is the name of the paint as Orville recalls, and was part of the Color of the Month promotion in Colorado. The door data tag has a blank color code indicating that it the exterior color was a special order, the order district is 51 for Denver, the special order number is 3000, and the build date is 15D for April 15th. The car has been repainted but it is very close to the original color. (from page 38 of the 1968 Collection) Under this black paint is Caribbean Coral paint. It's a 'Rainbow of Colors' Special edition 1968 Mustang. It's owned by Brandon Salisbury. Brandon is 16 and is planning to restore the car with his Father. The Marti report states that it is a Special Paint Coral, Ford #WT9012. It was built in San Jose (8R) on 3/8/68 and ordered through the Salt Lake City DSO (73) with special order# 3061. It was sold through Gooding Ford in Gooding, Idaho. This paint was also offered on the 'Color of the Month' special edition Mustangs. This Coral Mustang was built about a month too early to be considered a 'Color of the Month' special edition. The Coral paint was an April color. The special order number on this Mustang is close to 3059 which we know is part of the 'Rainbow of Colors' promotion. We believe most of the 'Color of the Month' cars came from the Metuchen New Jersey factory, and we have never found an advertisement for the 'Color of the Month' promotion from the Salt Lake City area.